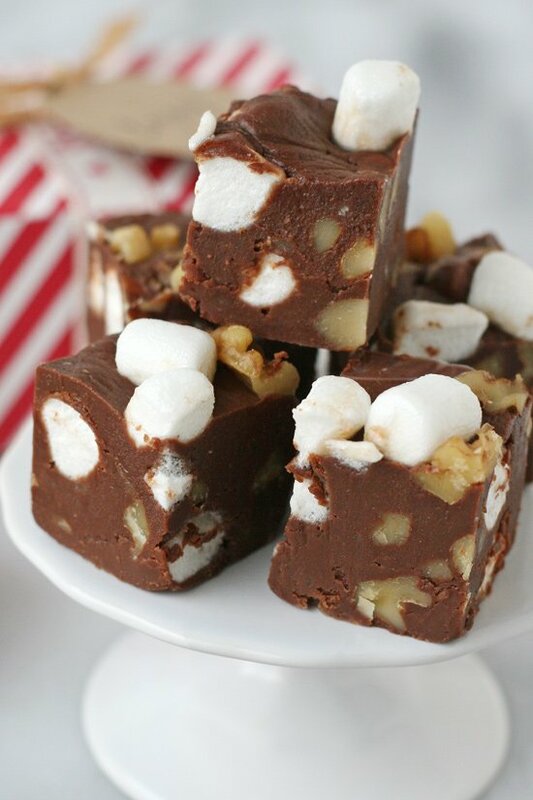 The holiday season calls for extra special treats… and this Rocky Road Fudge fits the bill! Smooth, creamy chocolate fudge is a pretty amazing treat on it’s own… but when you add marshmallows and nuts it’s taken to the next level! In my opinion, good fudge has a few specific qualities… it should be smooth and creamy (yet still hold it’s shape), and although fudge by nature is very sweet, good fudge should have a balanced flavor, not simply knock you over with sweetness. 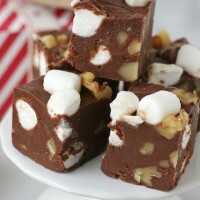 This Rocky Road Fudge recipe fulfills all of my requirements for perfect fudge! Rich, creamy chocolate fudge gets dressed up with marshmallows and nuts. 1. Toast nuts by spreading on a baking sheet and baking at 375*F for 5-7 minutes. Set aside. 2. Spread mini marshmallows onto a baking sheet an place in freezer while fudge is being prepared. 3. Prepare a 9"x13" pan by lining with parchment paper, allowing the paper to hang over the edges a bit, so you can use that to pull the fudge out of the pan later. 4. In a large pot (I used my Le Creuset French Oven), combine sugar, butter and evaporated milk. Heat over medium-high heat until it reaches a boil, then reduce the heat a bit and simmer, while stirring almost constantly, until mixture registers 234*F. This may take 10-15 minutes, or more. 5. As soon as the mixture reaches 234*F. remove pan from the heat and stir in nuts (reserve a few for the top of the fudge, if desired), marshmallow fluff, vanilla and salt. Stir, to fully incorporate marshmallow fluff, and allow mixture to slowly cool. 6. When the mixture has cooled to 160*F (this may take 15 minutes or more), add chocolate, covering fully with warm mixture to help the chocolate melt. Allow the chocolate to melt on it's own a few minutes, then stir until chocolate is fully melted and well combined. 7. 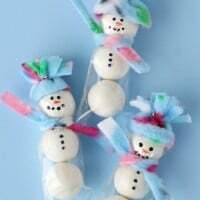 When the chocolate has been fully incorporated, add frozen marshmallows and stir to even distribute. Reserve a few for topping the fudge, if desired. 8. Spread fudge into prepared pan, and spread with spatula as best as possible. Top with a piece of plastic wrap, then use your hands to level out as smooth as possible. Remove plastic wrap and cool fudge in the refrigerator at least 4 hours. 9. To cut fudge, lift up on parchment paper overhang, and move to a cutting board. Use a sharp knife to cut into small squares. As needed, run the knife in warm water, then wipe dry between cuts. Fudge may be store in an airtight container in the fridge for up to a month. Fudge is best when served at room temperature. Choose good quality chocolate and chocolate chips. I used Ghirardelli. In order to ensure consistent recipe success, a candy thermometer is required. Do not add chocolate until the sugar mixture cools to 160*F, or the chocolate may separate. Recipe source - Glorious Treats, adjusted from America's Test Kitchen. For consistent results, this recipe does require a candy thermometer. You can purchase a candy thermometer at most any kitchen supply store, including Wal-Mart or Target. Last year I upgraded to a Thermapen thermometer and if you make candy even a couple times a year I would highly recommend investing in a Thermapen! This is my favorite fudge ever Glory!! Love it. Yum! I love anything with chocolate – your fudge looks great. this sounds so yummy. Thank you! Rocky roooooad!! The only thing that could make fudge better. Lovely Glory! Oh how lovely! I really love that your rocky road is nice and thick. This would make such a lovely Christmas gift!!! I love rocky road! I think this will make a great gift for the girls teachers this year. Thanks again for a great recipe! Love you! You just turned one of my mom’s all-time favorite ice cream flavors into fudge. We absolutely love you!! Oh My!!! 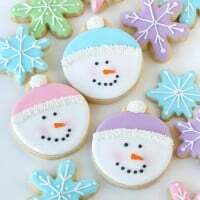 so yummy and your photos are amazing! Fudge definitely needs to be smooth and creamy! 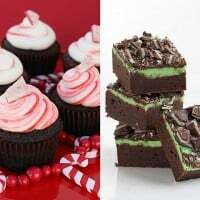 I always associate fudge with the Christmas season! I think I will need to try that out for tomorrow when my boy gets his braces off!!! I looks like heaven!! 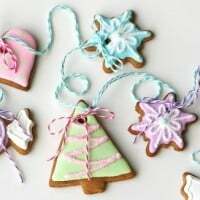 I made a batch to add to gift baskets for the holidays. This is by far the best fudge I ever had!! No more buying fudge ever! Seriously this is fantabulous !!!! I made it today and couldn’t believe how good it is. I think I will use this recipe as a base for different variations. Thank-you for sharing ! I’m so sorry to hear you did not have success! Without being with you in the kitchen it’s hard to guess what may have gone wrong. I wonder if the mixture was still too warm when the chocolate was added? Did you use a thermometer to check your temperatures? I hope you give it another try. I have had many readers let me know they had success and loved the recipe.